This ministry was built on faith and love - faith in Jesus and love for souls. Down through the years, God has been so good. 1969- Started the storefront ministry. 1970- Purchased the Batchelor Movie Theater for the sanctuary located at 22 East Second Street, Weldon, North Carolina. 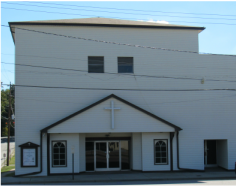 1979- Purchased the Western Auto store for the Sunday School annex and fellowship hall. 1988- Erected the Administration building on the lot between the sanctuary and Annex to house the Pastor's study, choir rooms, prayer rooms, and young adults classrooms. 1992- Purchased the Bounds Motor company for parking lot and recreational facility. 1993- Celebrated the Church's Mortgage burning! 1997- Purchased Knight property across the street from the sanctuary for parking lot. 2010- Purchased 22-passenger Church Bus. TO GOD BE THE GORY FOR THE GREAT THINGS HE HAS DONE! "This is the Lord's doing; it is marvelous in our eyes."